iSCAPE provides means to achieve an air pollution free (low carbon) society through the application of new sustainable methods and approaches integrated into urban design and policy guidelines. 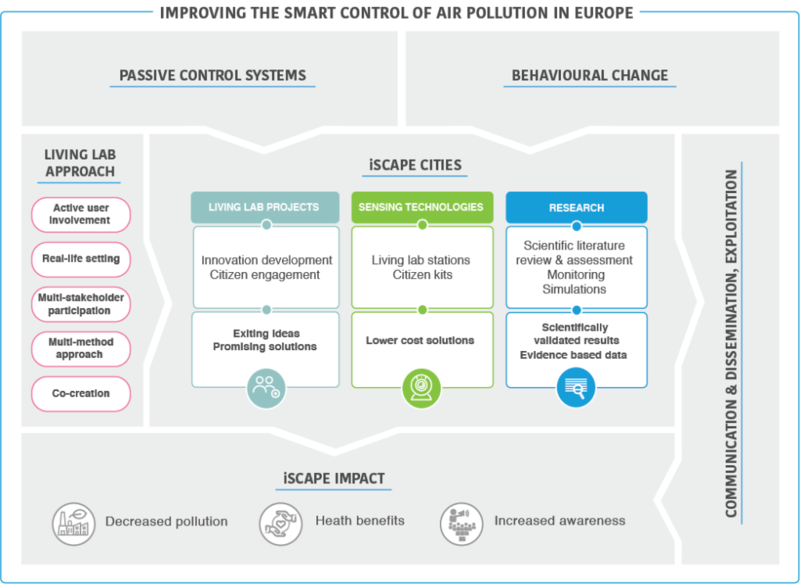 To achieve this, the iSCAPE concept is based on the following: The workflow of the project is driven by two main solutions, Passive Control Systems and Behavioural Change, and it gathers the tasks into three blocks of implementation. The first one is dedicated to the deployment of the pilots in the cities, and it kicks off with a thorough and neutral assessment of existing and future challenges and opportunities for the cities with respect to air quality and climate change, and the role of infrastructural interventions to offer solutions to the corresponding challenges will be carried out. Once the possible solutions are identified, a dialogue with the citizens of each test city and relevant stakeholder is initiated through Living Labs, to assess non-technical challenges to implementation of both the physical and behavioural interventions that will be implemented or assessed in iSCAPE. Those activities will be integrated with the use of Sensing Technologies and the development of two quality monitoring kits: one to assess the effectiveness of the implemented solutions to improve air quality (high-level monitoring kit) and one to involve and educate citizens (low-cost monitoring kit) as part of the activities which will be hosted at the Living Labs. In parallel, an accurate design and evaluation campaign will be necessary to assess the effectiveness of these solutions for different climatic conditions related to location and seasonality. As such, iSCAPE will focus on Research activities and run air quality and meteorological simulations at various scales to preempt the effects and improve the impacts of these solutions and an extensive monitoring to assess the effectiveness of such solutions. This evaluation is complemented by simulations which have a direct impact on population behaviour, including a bottom-up feedback for policy makers by linking anthropogenic urban activities to environmental models for providing new insights on how traffic policy measures need to be designed to improve environmental quality. Those three blocks of activities will be strengthened by examining the strategies needed for the overall transition to successful exploitation and policy instruments and priorities and by integrating the results of all the work packages for the dissemination and communication process.